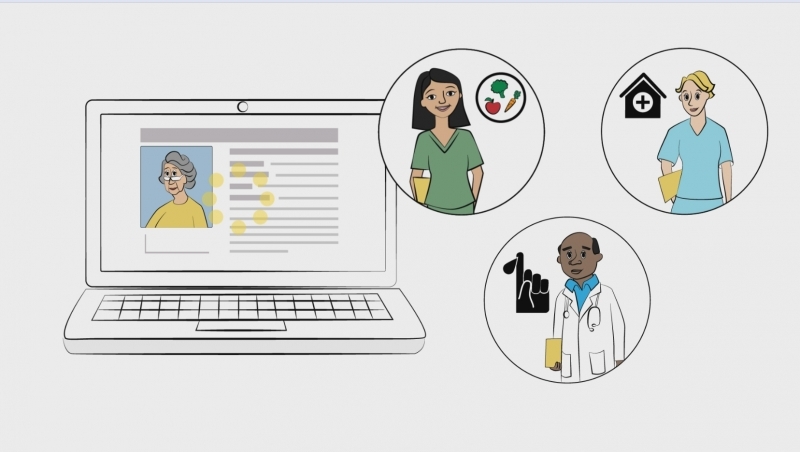 We had a great time working with StrataHealth to create this Explainer Video for software they are developing. Strata PathWays™ automates patient flow management, reducing time spent on manual transition processes, increasing clinician intercommunication and strengthening health care system performance across the care continuum. But why not watch a fun Whiteboard Animation to help you understand this even further. StrataPathways Software Solutions - Promotional Video from Sandra Tournemille on Vimeo. When I first met with StrataHealth, it was clear they had a successful eReferral product that would revolutionize the healthcare system. They described their eReferral product as a powerful set of software tools designed to achieve greater efficiency and increase productivity when it comes to patient transitions within the healthcare system. The distinguishing features of StrataPathways is transparency the software offers across the care continuum along with analytics to aid patients with decision making. We all agreed the concept of HOW the product improved healthcare needed a great deal of explaining. The clients were looking for a way to portray their story and engage their audience of healthcare workers and administrators with a whiteboard style video. Every video begins with a script, so once we had extracted all the content and information from our client meetings, Harry put his head down and began the difficult work of storytelling. 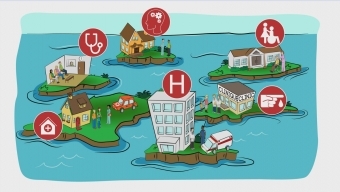 He had the idea of comparing the health care system to an archipelago of islands. This comparison was brilliant as it helps the viewer immediately relate the product to something concrete. As with every project, the script went through several drafts and the client was involved a great deal in the process. We had to make sure every detail was correct and at the same time, keep the story concise and intriguing. After a few weeks of script development, the client signed off. We then moved onto storyboards. As I designed the boards, I kept with the idea of islands throughout the illustrations. I envisioned a group of islands along with each organization on their own island. I was also conscious of the main character design. The clients wanted their audience to empathize with the main character and recognize their own struggles or someone they love, through this particular person. After some back and forth, we all decided a senior citizen would portray the story best. She would evoke empathy and remain memorable to the audience. The visual story would follow our main character as she transitioned from the hospital to a long care facility. The animation process was a lot of fun for this project. I love creating the illustrations and then seeing them come to life through the whiteboard technique reveal. For our studio, this is the most intense part of the process. We always keep illustrations, script and design in house, but often enlist help from other animator to complete a project on time. I was excited to work with a very talented animator on this project and thanks to her quality turn around, everything went as planned. We delivered the project in early January 2015 and the clients were happy to have the video on YouTube by mid month. Although Strata Health is based in Canada, they have a wide reach across Europe. With offices in France and UK, they were interested in translating the video for those 2 specific regions. The clients provided me with a French and UK recording of the voiceover and on my end, I edited the video to reflect a specific video for each delivery. Complete with correct text translations and logo splash screens. Both of these translations were a quick turnaround and the end result is customized sales tools for the French and UK team. Our firm had the opportunity to work with Sandra on the development of an animated video that is used to introduce customers to the problem we solve within health care. Sandra was excellent to work with. She quickly suggested a theme that clearly communicated our intended message and the complex problem we solve. She was very creative, professional and easy to work with. She communicated project activities and timelines and was very good and letting us know if there were going to be any issues with the timelines. We are quite excited about the results and would recommend Sandra to any firm interested in developing creative branded marketing materials.